Underground Bodybuilding: The Science Of Arm Training! If your arms haven't grown in a long time, then it's time to make a change - break the plateau. I have an arm workout here that will give you great gains. Check it out! You know the world has changed when the average lifter wants a baseball player's physique. A big chest, a thick back, and jacked arms pretty much completes the wish list for most. Now whether or not all of these players achieved their results with steroids, I don't know. The fact is, they sure as heck didn't get those arms by training with kickbacks and concentration curls. If your arms haven't grown since you thought baseball was drug-free, then it's time to make a change to your workouts. And I'm going to show you how to use efficient and effective exercises in a scientifically-designed plan that will add more size to your arms than a week at BALCO labs. Unlike the average gym member, the lifter that gets results trains with a plan (even on arm day). While my sets and reps scheme might be "out in left field" compared to what you are doing now - but believe me, it's guaranteed to improve on most arm-training programs. But if you insist on playing in the 10-15 rep range for every exercise then you are bound to plateau and have minor-league arms. Research shows that a wide range of repetitions (from 3 reps per set to 12 reps per set) can lead to big-time gains in muscle size. Power-Up: Big Weights, Low Reps! Using low reps and heavy weights for your arm exercises might go against the grain, but the following 'underground' bodybuilding program will work for arms and all other body parts (I'll go over more details in a future article). But for now, this is all you need to know. Consider this new-era, Underground Bodybuilding Training. In the first exercise of this workout, you'll do 3 sets of 5 reps with a heavy weight (that allows you to complete all reps according to the guidelines below). The goal is to build absolute ("maximal") strength and muscle mass (obviously). Increasing your absolute strength will help you lift more weight in all exercises. And if you can lift more weight, then you can train the muscles harder. In response, the muscle will get bigger to keep up to the demands of the heavy weights. In the second exercise of the workout, you'll use 4 sets of 8 reps. It just might be the optimal combination of intensity and volume for muscle growth and will work extremely well for lifters that have been plateaued (stalled) on higher rep sets. In the third and final exercise of the workout for the arms, you'll do 3 sets of 12 reps to add more volume to the workout and to fatigue the muscle and deplete muscle glycogen (glycogen is the name for carbohydrate stored in the muscles). High-volume training and fatigue cause the muscles to "stock up" on carbohydrate stores in preparation for the next training session. And when your muscles stock up on glycogen, they get bigger and future training sessions can be more intense. At the end of the 6 week program you'll be blasting through these workouts with more intensity and strength than you've had in months. I hope that this article provides you with a possible short-term remedy and does not confuse you more but rather makes you more aware of what is going on when your muscles become fatigued. One of the trademarks of my strength-training programs, as you will see in the months to come, is to use supersets as often as possible (although there will be exceptions to the rule). With supersets, we pair two non-competing exercises together to get more work done in less time, without sacrificing strength or mass. Muscle size is not associated with how long you spend in the gym. The training goal is to get in, work hard, get out, pound a PWO (post-workout shake), get home, eat, and grow. Another way to increase the effectiveness of the training program is to focus on the tempo of the exercise. Tempo just means the speed of the exercise. For example and for our purposes, a 3-1-1 tempo means you'll take 3 seconds to lower the weight, then you'll pause for 1 second, and then you'll lift the weight back up in 1 second. The body will adapt to any training regimen in time, so tempo prescriptions should be varied just like any other training variable. Find out how it can help you! A slow eccentric (lowering) tempo and a fast concentric (lifting) tempo will work your Type II muscle fibers the hardest - these are fibers that have the greatest potential for muscle growth. So you'll get your best strength and mass gains by using that general tempo arrangement. You may have gone through a tempo phase in the past for a couple of weeks and then due to human nature you probably got lazy and forgot about using it. But for the next 6 arm workouts, I want you to stick to the prescribed tempo. You'll see and feel the benefits after the first workout. Now all that remains is to choose the best exercises for building big arms. With the help of scientific research, experience, and some recommendations from Charles Poliquin, I've put together some of the most efficient and effective arm exercises for mass and strength. An Interview With Charles Poliquin! Charles is known worldwide for producing faster athletes. When a country wants a Gold medal, they come to Charles. Learn all about his training style, his customers, and why he is hailed the most successful strength coach in the world! After the 4-week arm assault I want you to cut back on your arm training for 1 week to allow your muscles to grow (and adapt to the training). If you regularly include an off-week in your training plan, take it here. Otherwise, skip your arm workout in week 5. You can return in week 6 with a new variation of this program. By the end of the program your results should be strikingly obvious and you might even be getting calls from major league sluggers for training tips. Note: This program is for advanced lifters only. If you are a beginner, you'll need only 1 set per exercise for the first two weeks and only two sets in weeks 3 & 4. Do this workout 6 times in 4 weeks. Reduce the amount of direct shoulder training you do in the 4-week arm training phase. Exercise descriptions: see the bottom of this article. Warm-up: For a specific warm-up, perform 2 sets of each exercise in the first superset. Start with 50% and then 75% of the weight you will use in your first "real set". Perform 8 repetitions for each warm-up set. Each pair of exercises constitutes a "superset". In each superset, do one set of the first exercise (1A) followed immediately (i.e., no rest between) by the next exercise (1B). Rest 1 minute after the superset and repeat. Use a proper weight for each exercise that allows you to get all repetitions completed with perfect form and the recommended tempo. It will require you to decrease the weights by at least 10% on most exercises. For descriptions of these exercises, please see the next section (below). Click Here For A Printable Log Of Superset #1. Click Here For A Printable Log Of Superset #2. Click Here For A Printable Log Of Superset #3. Move a flat bench into the middle of the squat rack. Set the pins 6-inches above your chest. You'll perform only the top half of a close-grip bench press. Keep your feet flat on the floor, legs bent, and upper back flat against the bench. Grip the bar using a shoulder-width grip & have your spotter help you take the bar from the rack. Keep your elbows close to your sides, lower the bar straight down to the pins according to the tempo. Pause briefly and then press the bar up in a straight line. Poliquin recommends that you keep a very small bend in your elbows at the top of triceps exercises in order to keep the muscles working at all times. 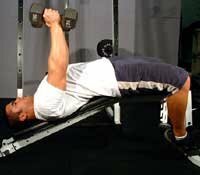 Lie on the decline bench with your feet anchored appropriately. Press the dumbbells over your chest to the start position and turn your palms in so that they face one another. Start the movement by bending the elbow and lower the dumbbells down and beside your head. Pause and hold for one second and then contract your triceps to extend your arms and move the dumbbells back to the start position. 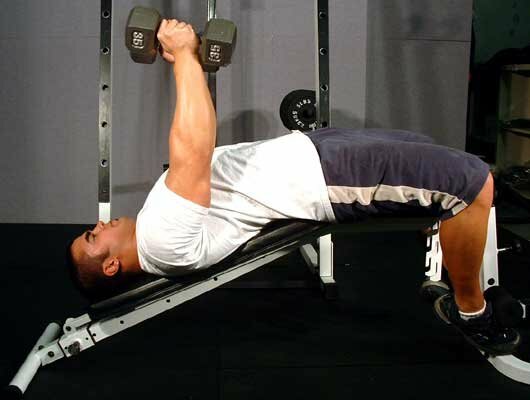 Lie flat on a bench with dumbbells in each hand. Hold the dumbbells at arms length over your chest, with your palms facing each other. Bend the elbows and lower the dumbbells behind your head. Pause briefly at the bottom, and then contract the triceps and extend your arms back up to the starting position. Sit at the preacher curl bench with a narrow, palms-up grip on the EZ-Bar. Poliquin recommends that you set the height of the seat so the tops of your thighs are parallel to the floor. 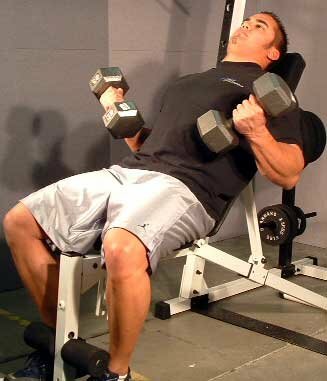 Lean forward so that your armpits are at in contact with the top of the preacher bench and as you lower the bar your triceps are in contact with the padding of the bench. Lower the bar until your arms are stretched. Pause briefly and then contract your biceps to curl the bar back up to the top position. Poliquin also recommends that you keep your wrists cocked back throughout the full range of motion. 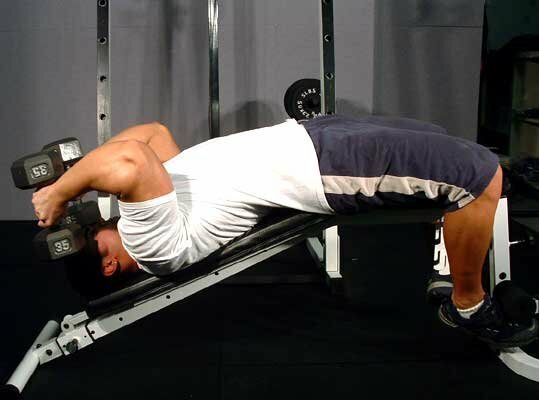 Set the incline of the bench at 80 degrees (in an almost upright position). Sit on the bench with a dumbbell in each hand and your palms turned up. Lean back and keep your back and head against the bench at all times throughout the exercise. Perform alternating dumbbell curls with each hand. Keep the palm up throughout the entire exercise. The Zottman curl is simply a dumbbell curl performed with a "palms down" grip as you lower the dumbbell and a "palms-up" grip as your lift the dumbbell. It's like doing a curl followed by a reverse curl. Set an adjustable bench so that the back is upright. Sit down and hold a dumbbell in each hand at arms length with your palm turned up. Contract the biceps and curl the dumbbell up to shoulder height. At the top of the movement, turn your palm down and lower the dumbbell back to the start position. Poliquin recommends that you keep your elbows glued to your sides throughout the lifting and lowering portion of the exercise.